This book was published in 1991 but has much to say to the Church today. It saddens me that a book like this has apparently had so little impact on the Christian Church. The author's main concern is for the way that mainline Protestant churches, particularly his own Presbyterian Church (USA), had been losing younger members to more conservative evangelical or charismatic churches. This trend has been well documented and is still very evident today. Some of these people grow disillusioned, in one way or another, with their experience and may seek to return to the mainline, but it's a trickle that won't sustain the churches. Many more just seem to abandon the Church altogether. Something is missing. The problem Johnson sees is the way mainline denominations have all but abandoned their emphasis on the need for a vibrant personal commitment to following Jesus as a disciple for the sake of the cultural relevance offered by social activism. "In an effort to be universally relevant, we have often forgotten about individuals both inside and outside the church who need to be introduced to a personal faith. ... Without personal conversion, either of the nurtured or dramatic type, the church lacks the energy to fulfill it's mission." (pp. 169-70.) The problem is that most of these members and clergy feel very uncomfortable or inadequate in talking to people about their commitment to Christ. In answer to this, Johnson draws on the tradition and practical skills of spiritual direction as a relational model for evangelism. While he graciously acknowledges that the more confrontational method of evangelism with its emphasis on dramatic, point-in-time conversion experiences may be effective for some people and certainly has its place, he accurately points out its weaknesses and helpfully suggests another way that takes more time and commitment to individual persons. 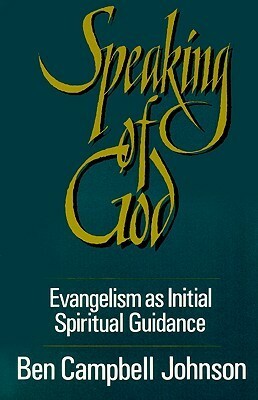 Listening skills, combined with questions from a genuine desire for understanding and acceptance of the person and the assumption that God is already at work in some way in every person's life, can go a long way toward helping people consider the life giving possibilities inherent in being a true follower of Jesus in the context of their own personality and experience. While this book's intended audience is for members and clergy of mainline churches, all Christian lay people and ministers will benefit from this book. It's easy for any church to align itself with one side of the ecumenical/evangelical divide and forget the whole of the Gospel message; to the great detriment of the Church as a whole. Many efforts at mediating the divide compromise too much. This book lays out a solid "both/and" position for the Church that may take more effort to explain and live out, but is more faithful to the entire mission of the Church in the long run. Sign into Goodreads to see if any of your friends have read Speaking Of God.